The nighttime, sniffling, sneezing, coughing, aching, fever, best sleep with a cold, medicine. Powerful Cold and Flu Relief. 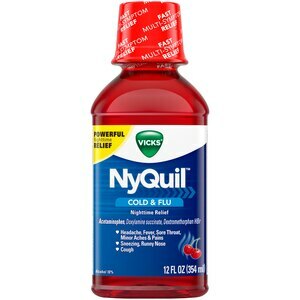 NyQuil Cold & Flu Nighttime Relief Liquid is available in Original or Cherry flavor. Active Ingredients (In each 30 mL Dose Cup): Acetaminophen 650 mg (Pain Reliever/Fever Reducer), Dextromethorphan HBr 30 mg (Cough Suppressant), Doxylamine Succinate 12.5 mg (Antihistamine). Inactive Ingredients: Acesulfame Potassium, Alcohol, Citric Acid, FD&C Blue No. 1, FD&C Red No. 40, Flavor, High Fructose Corn Syrup, Polyethylene Glycol, Propylene Glycol, Purified Water, Saccharin Sodium, Sodium Citrate. More than 4 doses in 24 hours, which is the maximum daily amount for this product. To make a child sleep. A breathing problem or chronic cough that lasts or as occurs with smoking, asthma, chronic bronchitis or emphysema. Trouble urinating due to enlarged prostate gland. Pain or cough gets worse or lasts more than 7 days. Keep out of reach of children. Overdose warning: Taking more than the recommended dose can cause serious health problems. In case of overdose, get medical help or contact a Poison Control Center right away. Quick medical attention is critical for adults as well as for children even if you do not notice any signs or symptoms.